Basir Ahmad Hussainzada reviews M. Taqi Khawari’s new book about the Hazara people for BBC Persian here. The book, titled The Hazara People and Greater Khurasan seems to be the most comprehensive and serious scholarly study into the origins and the history of the Hazara people since the publication of Dr. Said Askar Mousavi’s The Hazara of Afghanistan a decade ago. According to the review, in the section dealing with the origins of the Hazara people the author authoritatively rejects the widely held theory that Hazaras are primarily remnants of the marauding hordes (organized into “hazars” or thousands) of Genghis’s Mongol armies. According to the author, a glance into the intra-ethnic diversity within the Hazara people (divided into more than 700 different clans) reveals that not all the Hazaras descend from any single ancestral gene pool. Furthermore, the author gives a detailed account of the prevalence of Shi’a Islam among the Hazara people, who constitute the bulk of Shi’a Muslims in the otherwise Sunni-majority Afghanistan. As far as one can tell from the review, the author’s research into the Hazara migrations specifically into Iran and their subsequent settlement and acculturation there is groundbreaking. Most of the other topics dealing with the origins and the history of the Hazara people in Afghanistan have been previousely written about. All the same, the book is a welcome addition to the still sparse scholarship about the Hazara people. 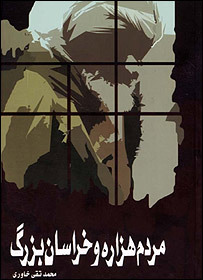 In the preface to his own book about the Hazaras of Afghanistan, Dr. Askar Mousavi claims that the Hazara people are the “least well-known ethnic group in Afghanistan.” Although the events of 9/11 and the subsequent US toppling of the Taliban focused the world’s attention on Afghanistan, and more importantly, despite the publication of the bestselling novel The Kiterunner, the Hazara people of Afghanistan remain one of the least known and studied ethnic groups (not that reading The Kiterunner in itself would be of any help in this regard, but the novel was the closest thing to a first encounter for many with the Hazara people.) Serious anthropological and ethnographic studies are particularly rare as most of new research and writing deal with such contemporary interests as their history and politics. The Hazara People and Greater Khurasan will hopefully be translated into English and read by a wider audience. If in five years it is still not translated, this writer -hopefully out of school by then- will make a serious effort at obtaining the translation rights. This entry was posted on Monday, March 12th, 2007 at 4:26 pm and is filed under Book/Report/Media/Blog, History. You can follow any responses to this entry through the RSS 2.0 feed. You can leave a response, or trackback from your own site. That should be an intersting book. That would be great to read. Hazara people need people like respected Dr.Mosuvi to research and publish books, tell Hazara stories and identities. It’s very important to have a sound understanding of our HITORY. Such books will indeed help in this regard. Thanks to the Author and the Publisher! OK? Not that I’m complaining, but slow loading instances times will often affect your placement in google and could damage your high-quality score if ads and marketing with Adwords. Well I am adding this RSS to my email and can look out for much more of your respective fascinating content. Ensure that you update this again very soon.